Every litter there are the things that I’ve figured out and those that I just have to keep figuring out. For years I used rik-rak to identify the puppies. 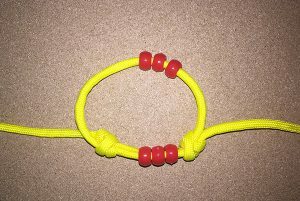 There was a litter that had yarn collars, one that I tried those little rubber bands kids make bracelets out of, and the easiest thing — litters that are colorful enough that I can tell them apart. Some litters have color patterns which make them easy to identify, but not this time. From the top, with one exception, these puppies look pretty much alike. I have once again tried the soft Velcro collars from Amazon. For some pups it seems to work, other collars get stuck to the bedding and quickly fall off. Last time I made some paracord collars. (There are instructions on Youtube and lots of Etsy sellers if you don’t want to do it yourself.) Since the velcro wasn’t working, and I needed something quickly so I could identify the puppies and track their weights I decided to make paracord collars again. 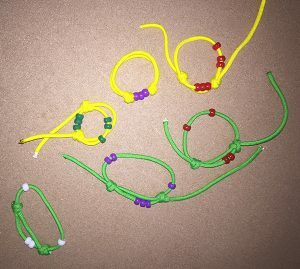 I used the two colors I had, and a bag of inexpensive beads from Walmart) to make them. The last time I drew patterns on the paracord with markers but they got dirty too quickly and in a few days, too many of them looked the same. The girls have yellow collars with beads, the boys have green.